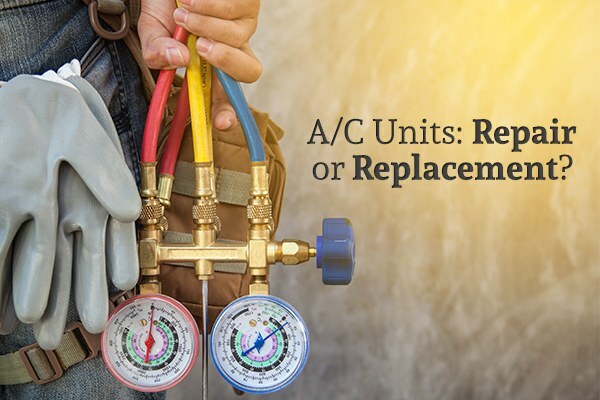 Home » Air Conditioning » Do I Need my A/C Unit Repaired or Replaced? If your air conditioner is only a few years old, you probably don’t want to get it replaced so soon. Usually, the repairs on a fairly new system will be simple and quick. Regular maintenance keeps your system in good condition for longer. Furthermore, when an A/C technician performs regular maintenance, it will allow them to catch any issues with your system early. They can fix any small issues promptly and keep them from getting worse. If you get your system routinely maintenanced, you likely won’t need extensive repairs or a complete replacement when the system breaks down. If the cost of repairs is less than half the value of your air conditioning unit, repair is often the better option. Keep in mind, though, that this only applies when your system hasn’t been needing constant repairs lately. If it has been breaking down a lot, it will likely keep breaking down in the near future. A lot of times, the cause of a noisy A/C unit is a relatively easy fix. You should always get the system diagnosed before making a final decision about repair vs replacement, though. Your HVAC technician can determine if the cause of the noise is truly a small problem. If you’re experiencing problems with your air conditioning, the issue may not be caused by the A/C unit. There are many parts of an HVAC system, and the cause of the problem may lie in any of these parts. A broken heat pump or leaking air duct are some of the other issues that may lead to air conditioner problems. If your A/C unit breaks down over and over again, it’s time to get it replaced. Over time, the cost of constant repairs will far exceed the cost of a replacement, so don’t wait too long to decide on replacement. Everything breaks down at some point. If your unit is over 10 years old, it will likely keep needing repairs before it just stops working altogether. The 10-year mark is usually about when you should consider getting your A/C unit replaced. Certain air conditioning units – especially older ones – aren’t particularly energy-efficient. Replacing your A/C unit with an energy-efficient model may have a high upfront cost, but it will afford you significant savings over time. As an added bonus, you may qualify for tax incentives if you have an energy-efficient air conditioner. If your system is constantly running out of refrigerant, you likely have a coolant leak. When this happens, it can be quite pricey to fix the leak and refill the refrigerant. The problem is especially bad if your unit uses R-22 refrigerant. Because R-22 is not environmentally-friendly, it’s being phased out, which means that the cost of R-22 coolant is very high. In addition, an R-22 leak will eventually cause the compressor to break down. When your system springs a coolant leak, it will likely be less expensive to replace it than to keep repairing it. The compressor is one of the most vital parts of an A/C unit. The cost to repair a compressor may end up being as much as the entire unit is worth. In addition, a compressor breaking down is often a sign that there’s an issue with another part of the unit. If you’re experiencing issues with your A/C unit, contact Cote’s Mechanical. Their expert HVAC technicians will diagnose the cause of the issue and help you determine if you need your air conditioner repaired or replaced. They offer a free service call with repairs, so don’t hesitate to give them a call.